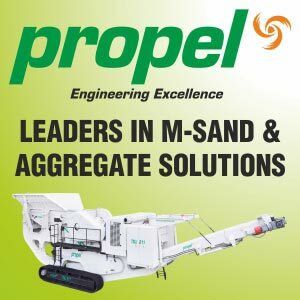 Propel Industries, a forward-looking and environment-conscious organization, is stepping up to increase manufacturing of M-Sand. The company has fortified its equipment with superior engineering techniques, innovative technologies, and cutting-edge manufacturing facilities to produce different combinations of sand. The manufacturing capabilities of Propel Industries include state-of-the-art machineries for producing superior quality M-Sand and P-Sand of various sizes. The company is driven by its aim to save precious river sand by coming up with viable solutions and alternatives. In a short span of time, Propel Industries has installed hundreds of M-Sand plants with Eco-Wash, Pro Air Classifier, Pro-wash, and Sand wash across India. With Propel supporting the industry by making advancements in its equipment and ensuring regular quality checks of the products, its customers are very happy as their production has doubled with the same power consumption and operating cost, along with high quality of the output. M-Sand has been used to make quality concrete for decades in India; it has been classified as Zone-II and Plastered Sand as Zone-IV. This eco-friendly product is much appreciated by industry stalwarts and many research studies have also confirmed that M-Sand is the right alternative for river sand. “M-Sand is a 100% substitute for river sand,” avers Dr. Kuncheria P. Isaac, Vice Chancellor of Kerala Technical University. Many companies are now producing M-Sand and vigorously promoting it in the construction industry.